But there are serious problems with using the “opportunity cost” as a way of calculating the cost of REDD. Using this approach, the cost of REDD is based on estimated land values, which are in turn based on the (discounted) values of the agricultural products produced on the land. An obvious problem with this approach appears when the person clearing the land does so largely to feed themselves and their family. The monetary value of the agricultural products might be very low (and therefore the opportunity cost is low), but for the family concerned the food produced is extremely valuable because without it they would go hungry. Let’s look at Cameroon, as an example of this. Grieg-Gran estimates that “annual food crops” (long and short fallow) account for 59% of the country’s deforestation annually or 129,800 hectares. (For the moment, we’ll put aside the question of whether the rotational fallow farming involved is actually a cause of “deforestation” or whether it is a long term sustainable use of the forest. Grieg-Gran describes 44,000 hectares of the “deforestation” as “long fallow farming”.) Grieg-Gran produces a figure for the value of the crops produced, multiplies it by the area involved and comes up with a figure of US$81,595,000 as the cost of stopping this “deforestation”. But paying farmers not to produce food raises a series of questions. How and to whom would the money be paid? Since many live in remote areas, wouldn’t this also incur costs? If farmers don’t grow their own food, where is their food to come from? If it is to be imported, will this mean more greenhouse gas emissions than produced by rotational fallow farming? Would the farmers be taught “less destructive” farming techniques? If so, how much would that cost? Or would they be removed from the forest to prevent them from taking the cash and carrying on as before? If so, where would they be moved to, what would they do there, and how much would that cost? And what if they moved to the city found work and started leading a far more carbon intensive lifestyle than previously? True, the cost might well lie somewhere between the highest and lowest estimates. Then again, it just might not. A recent report from the Rights and Resources Initiative, calls into question the opportunity costs approach for estimating the cost of REDD. The report “Does the Opportunity Cost Approach Indicate the Real Cost of REDD+?” can be downloaded here (pdf file 848 KB). “Finally, we have to remember that opportunity cost is not a static concept. It changes as market forces change, as technology improves, and as new technologies emerge. In the particular case of deforestation to open land for bioenergy crops, Persson and Azar (2010) point out that if the price of carbon increases so would the price of bioenergy produced from bioenergy crops that are responsible for a significant amount of deforestation. Land prices, in turn, also would go up, since the opportunity cost of not producing the bioenergy crop would increase. This relationship would continue up to the point where other renewable, non-land intensive energy alternatives would become competitive. Most of the existing studies do not add a dynamic perspective on how opportunity costs will change as relative demand and supply conditions for timber or products produced on cleared forest land will change (under the assumption of negligible leakage). The report looks at several real-life situations: when deforestation is illegal; when removal of forest is permitted by law; and when legal property and use rights are not clear. In each of these cases, the authors examine the implications in terms of using opportunity cost to estimate what it would cost to stop deforestation. Excellent posting, REDD-Monitor. The problems with opportunity cost accounting are so glaringly obvious when explained like this that it only serves to make one wonder why so much credence has been given to the work of McKinseys, whose opportunity ‘cost curves’ purport to show how much (forest) carbon can be saved at what price. It’s noticeable that in their general global carbon emissions cost curve, as well as all of the specific cost curves they have produced for REDD in various countries, stopping slash-and-burn farming appears very prominently as a large potential carbon saving at very low cost. Clearly, none of the McKinsey management consultant wonks producing these curves have the slightest idea of the reality of stopping shifting farming, or indeed whether it’s even such a good idea to try and do so. This is an agreeable listing of caveats of standard opportunity cost analysis. But, it is biased towards sources of overestimation and the actual study provides little empirical evidence for the case it makes. Studies of real-world PES schemes in the Andes, for example, suggest that some land users actually accept payments that are lower than estimated opportunity costs, because regular payments are less risky than the expansion (!) of the agricultural activities they are intended to avoid. Other than that, who said that opportunity costs are the real costs of REDD? Most of the cited studies don’t. If the opportunity cost approach does not indicate the true cost of REDD, then what is the point of it? You estimate someone’s opportunity cost in order to get an idea of how much she would be willing to accept in order to change behavior (e.g. conserve instead of deforest). Ideally what you get is the land user’s cost of conservation. REDD essentially means implementing policies that induce land users to conserve. The cost of policy implementation is a whole other business – Stern does know this too, which is why he emphasizes the term “opportunity cost”. Now it is likely that opportunity costs will dominate the total costs of REDD if it was implemented through compensatory transfers. The real problem is that the conditions for such transfers to function effectively are seldom in place where deforestation occurs. Even them estimating opportunity cost has a point, because it becomes a tool to estimate how much people will loose if governments choosed to implement REDD through regulatory fine-based policies – not actually a remote possibility. So in other words, if I understand this correctly, the kinds of figures that McKinseys have been using, especially in the case of stopping small-scale/slash-and-burn farming, are often not real “opportunity costs” – because they represent only some proxy ‘cost’ based on estimated farm-gate prices x production, rather than what small-scale (or indeed large-scale) farmers would *actually* be prepared to accept to stop what they are doing? This seems to me to be rather important, because whilst it might not be apparent to the management consultants at McKinseys, it is very well known in the expert development field that subsistence farmers place extremely high values on such things as security of land and reliability of income(hardly surprising: their lives depend on it). As far as I am aware McKinseys did not actually go out in the field in Indonesia, Congo or Guyana and ask peasant farmers how much they would *actually* want to be permanenly moved off their land or told to be ex-employed in something completely different, or given food to eat instead of growing it themselves, but I bet that if they had they would not have assumed that stopping this kind of farming is going to be as cheap as they claim in their costs curves. This in turn has wider significance because if, as you probably rightly say, ‘opportunity costs’ turn out to dominate the total cost of REDD, then any underestimate in the real opportunity costs is likely to be reflected in major under-estimates of the total costs of REDD – possibly to the extent that the real cost of REDD starts to look much less attractive than other carbon abatement strategies. And seeing as how the indications in countries such as Guyana, Congo and Indonesia are that the government will only really target small-scale farmers and other politically marginal groups (because they don’t want to upset their cosy and lucrative arrangements with the really big culprits of forest-based emissions such as loggers and palm oil companies), then it seems there is a high risk of failure of the overall REDD programmes because of this flawed methodology. As regards the total costs of REDD, we do need better estimates and (just like decades back when experts promised the cheap solar and wind energy revolution) the bill is going to be higher than many have thought (probably worth it anyway). But, why blame it on an economic concept ? – it all depends on how it is applied and interpreted. Probably the best safeguard against the kind of REDD-induced-impoverishment horror scenario that some people are painting is to push for compensation schemes that are truly voluntary – then farmers can at least decide for themselves whether their opportunity costs are covered or not and opt out in case of the latter. In my experience we are using Opp Cost to make arguments at a policy level, but with no real intention of using it at a micro level. So McKinsey can use their powerpoint to convince governments that REDD will not kill off their key targets – jobs and growth – by demonstrating the apparently low hurdle price for carbon that will equal the marginal utility of the alternative use (oil palm, usually). This is somewhat disingenuous as its logical conclusion is that every tree in the forest is worth the NPV of its alternative use, which assumes unlimited demand for palm oil at any price, and unlimited labour at any price. So the problem with Opp Cost is that it envisages the theoretical possibility of moving towards 100 percent forest loss, without (usually) taking into account the steeply rising value of the remaining forest, and the falling prices of the increasingly abundant alternative production. But conservation NGOs like this approach as it taps into their crisis narrative. On the ground, I am yet to have a ‘willingness to accept’ conversation with a forest dweller to reveal their opportunity cost. Perhaps this is because we are too busy talking about all those other issues that actually determine land use and livelihoods, such as governance, markets, infrastructure and of course tenure rights. REDD+ is a means to an end, which hopefully will stimulate the sector reforms needed to improve livelihoods for forest rights-holders. But those I have met seem unimpressed by the idea of rent as a replacement for their current land use, and unmoved by the notion of calculating their opportunity cost. @Jan, Sven and Dominic’s points all well taken, but the worrying thing is that, as the opportunity cost studies *are* taking place before the policy and programmes are being designed, and explicitly incorporated into the resulting programming (one can see this in, for example, the RPP for DR Congo, and the Guyana-Norway MoU), the methodology is no doubt setting some of the priorities and determining scale of funding around which those programmes are being built. So, broadly, $X million is being committed to deal with ‘the problem’, which is largely determined as being small-scale/susbsistence farmers (which, from the opportunity cost perspective is convenient, because these have the lowest opportunity cost) so counntry Y then finds itself in the position that it has $X million and a lot of international expectations that results will be forthcoming, but then it finds that it’s actually much more expensive and difficult to deal with ‘the problem’ than it was led to believe. What is the country to do? Of course there is always going to be a tendency to coercion, but the flawed opportunity cost methodology is likely to exacerbate this by suggesting that susbistence farmers can be ‘dealt with’ at a cost that, in reality, can probably only be achieved if they are ‘involuntarily resettled’, i.e, forcibly evicted at gunpoint. It is surely not without reason that the leading tropical government players in the REDD debate have fought tooth and nail to keep land rights and indigenous peoples rights out of the UNFCCC agreement and now out of the Interim REDD+ Partnership too. I think most of the governments already have a very good idea of who they intend to target with their REDD programmes (in some cases, it would be just an extension of decades of political stigmatisation, discrimination against, or neglect of, the forest-dwelling poor) and the McKinseys studies provide a perfect pseudo-economic/scientific rational for doing do – albeit that, as we all seem to agree, the actual methodology of these studies seems to leave an awful lot lacking as a basis for programme design. Fantastic posting and discussion and precisely the issues I deal with as a project developer in South America. I am developing PES projects in the Andes, and from our experience, Jan is correct. Many marginalized forest communities place a great deal of value on variables such as territorial recognition and their cultural and sometimes spiritual ties to the forest. Commercial logging and monoculture expansion are realities here. This also leads to unpredictable costs of PES implementation, such as the high cost of monitoring conservation areas and confronting large business interests (banana, oil palm, and logging companies) who stand to lose. Local stakeholders that are interested in PES value maintaining the integrity of their land as opposed to what they perceive to be the other option–selling out to large business. In the voluntary system, this can work out positively for the developer and the community because the local stakeholders will happily carry out conservation activities as long as they are compensated fairly. If the market tanks, they will seek alternative means of development. At least they will still have their trees and land. Government implemented models are worrisome for the reasons B Witness mentions. On the other hand, we are working in a context where the government is given incentives to deforest and expand monoculture, which has proven to be a disaster for marginalized forest-dwellers in Latin America and elsewhere. I think that using broad opportunity cost models at a national level can be useful because we need some kind of model to influence the formation of tree-friendly policy. The question posted in the title of this article – do opportunity costs reflect real costs – is quite easy to answer. Anybody with a basic understanding of economics and finance could tell that the answer is “no, they don’t”. Opportunity cost is an economic concept, essentially, a philosophical concept. By definition, taxes, which are considered a transfer payment, or transaction costs, which can be quite substantial in the REDD+ case, are excluded. On the other hand, real costs, ie, the price that one really has to pay for a particular good or service, is a financial concept. Real costs include taxes and transaction costs. Economic costs and benefits relate to policy making, reflecting the costs and benefits to society. Financial (real)costs and profits relate to business decision, ie, commercial undertakings. Hence, when designing fiscal policies and incentives that aim to influence commercial decisions by private sector agents on, say, the use of land or forests, then financial cost should be the main point of reference. As pointed out by Dominic, philosophical values don’t really matter to forest dwellers, nor do they matter to business. I feel that a little bit of knowledge about, say, the definition of the terms that we use in the REDD+ debate, would go along way to improving the unfavourable signal-to-noise ratio of the current debate and might bring us a little bit closer to developing credible and robust solutions that actually work in the real world, that is, in the world that lurks behind the words. Very good argument by all commentators. It surely needs to be stressed more in the REDD+ debates, publications and policies that Opp Costs are not REDD+ costs. There are REDD/PES areas where people receive more or less “enough” payments to alter their land use pratices, but conservation implementation against outside invasion is still so faulty that “the reserve hardly exists”. REDD target areas are often remote bringing tremendous transaction costs to any implementation effort -especially ensuring free prior informed consent – and often enough big land use changers like palm oil, cattle ranchers, logging or soy bean are left outside of REDD schemes, while they are responsible for the largest share of forest loss. How can REDD not pester poor small holders beyond food security, reward good forest stewards but still fend off big money interests of capitalized deforesters? It is encouraging to see some comments reflecting the real practicalities. Allow me to add a few more. It is unclear how the revenues from REDD carbon sales will actually flow to those responsible for slash & burn or logging in countries such as Indonesia where I have worked. Per Indonesian regulation, the revenues will be divided amongst developers, the government & the communities. (Minister of Forestry Regulation No. 36/Menhut-II/2009) The % that each sector receives is dependent upon the land use classification which one could argue is associated with “opportunity costs”. However, an equitable distribution of the revenues to those who will actually be impacted is unlikely. Further, it does nothing to diminish the interest of logging companies operating illegally unless the government gives some of their share to them – also unlikely. 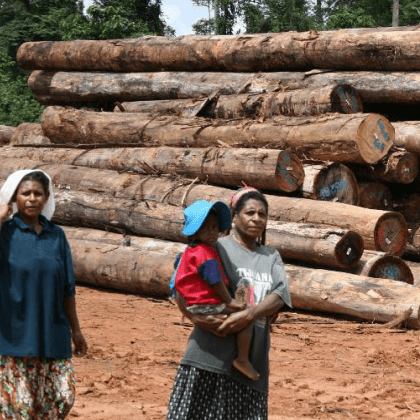 Many profit from the illegal logging industry, including: local officials, the police, the military, & local and regional people that do the work. In the province of Central Kalimantan, for example, when illegal logging was at its peak in the late 1990’s, workers commuted regularly by water taxi from South Kalimantan Province. The reality is that forests in most of Indonesia (& most of SE Asia) have been over exploited by legal & illegal logging and they need 30+ years to recover. Production of both quantity and size of logs on Borneo has fallen significantly in the last decade. REDD is an opportunity to secure substitute income from forests while they regrow – and then we can expect them to be logged again. Therefore, it is particularly risky to rely on the permanence of REDD offsets, especially later vintages in the life of a project. Further, stopping slash & burn practices in the remote areas such as on Borneo is very very unlikely to happen. People don’t have alternatives. As pointed out in this article, where will they get their food if they don’t grow it? The local markets depend on the local growers. The communities simply will not comply – for understandable reasons. REDD is seriously challenged by additionality, leakage, permanence & social equity. These issues have not been resolved, contrary to what many are saying.